First, I tend to use four fields (HR, Pace, Distance, Elapsed Time) – thus for three fields I have to drop one (I usually drop distance as I train mostly based on HR/Pace/Time). The second challenge with the three different screens is in using the bezel. If you ‘lock’ the bezel, you can’t change the screens. Thus you have to unlock the bezel, press menu briefly (but not too briefly as it won’t catch, and not too long, as then it will actually show a menu), and then cycle through which screen you want. Of course, remember that you’re either running or cycling at the same time – adding a bit (a lot!) of challenge to the task. very huge and fugly! but v awesome! good for running, cycling and swimming! 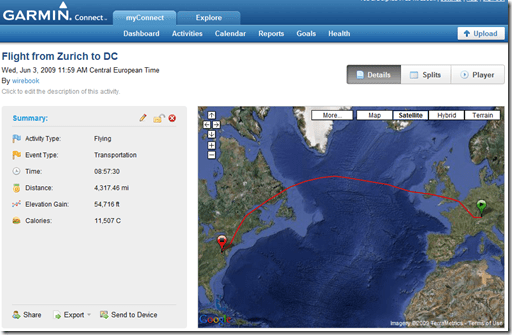 DC Rainmaker even used it to measure his flights! Using it while on the run…. Like most running watches (GPS or foot pod), it will give you pace as you go along. If you’re in ‘run’ mode, it will show it to you in minutes per mile (or KM per mile), if you’re in bike mode it will show it to you in MPH. These are all changeable and switchable to metric. When in operation, the watch gets divided in up to four quadrants to display information (depending on how you configure it). I typically run with pace, heart rate (HR), distance and lap time. One other feature to call out is the ability to race against at ‘little man’ at a given pace (called Virtual Partner). This is a software feature on the watch that shows you how far ahead/behind you are compared to the little man (like racing a real person) Though I don’t use it much (as I train mostly based on heart rate), it is a neat way to motivate yourself if you’re training solo. 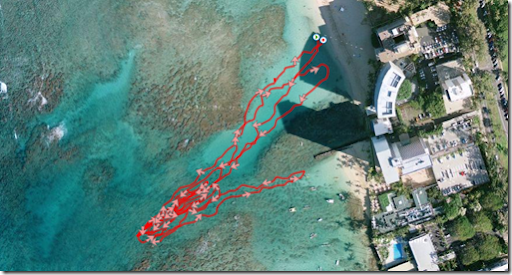 In short, you can actually use the GPS features during open water swims – I wrote up a long post on all the details about it – so go here. But essentially you place the 305 into your swim cap (usually in a tiny Ziploc plastic baggie) and it’ll track your progress. However, the HR strap won’t generally work (at least consistently). The Garmin 305 specifies a underwater rating to allow it 30 minutes of time submerged at 1 meter – which is more than enough depth for your average open water swim (unless you plan to dive with it). By using a waterproof Ziploc, you in effect extend the time to cover longer swims. I was up hiking in the Shenandoah National Park (instead of cycling for once) and did a very short (1.4mile) trail hike. It was basically through wooded terrain down a ravine following a waterfall. The Garmin stayed on track and was dead on with the measurements compared to what the National Park Service said the length would be. I also never lost signal in the woods. Granted, these were wimpy East Coast woods without tall pine trees like the West Coast – but a good sign nonetheless. It gave us the same distance going up as when we went down. That’s good. However, I have found that running (or even worse – mountain biking) with tons of switchbacks tends to cause device confusion in heavily wooded areas. You can increase the frequency of position updating – but at a serious hit to your battery. Given how rare I use it in deep trees, I’m not worried. Of course, hiking is just the tip of the spear with all the fun you can have with it. How about turning it on and tracking a flight to the other side of the world? Yup, I’ve done that a few times. And even though the battery only lasts 10 hours, you can easily extend that to well over 24-36 hours with this cheap little $15 device that I wrote about. I’ve also used it to Geotag photos that I’ve taken while being a tourist. I simply download the GPX file(s) afterwards, spit it through some software and I’m good to go, all my photos are quickly tagged with their exact location. Lots of fun stuff you can do with it. i suppose function always triumphs form at the end of the day so i guess i’d go for 305! i suppose i can wear another watch with my dresses anyway!! This entry was posted in Uncategorized and tagged devices, gadgets. Bookmark the permalink.